I've never seen a guy so eager to get his hands a boiling pot, and some butter and garlic. Actually, this crab is safe and sound and on display in the National Sea Life Centre in Birmingham. 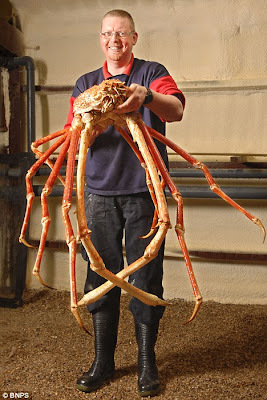 This Japanese spider crab (Macrocheira kaempferi) is the largest ever seen in Britain. It's already got a claw-to-claw spread of 10 feet. and it's still growing. Of course, all that size doesn't do it much good out of the water, where its weight is such that it can barely support itself. But in the deep it's a nimble, lethal predator. I smell a future Hollywood movie offer for this star-in-the-making. "ATTACK OF THE 10 FOOT CRAB MONSTER"!!! Its' a mighty crab. I 've never seen a crab as big as this. GIMME THAT MELTED BUTTER, NOW!!! haha i saw this crab this weekend when i took my little boy to the sealife centre!